For easy navigation through the questions, we are creating a table of contents below so that you can click on a question and jump directly to the answer you are looking for. What is Future Developments Holdings Private Limited? How is HRL Associated with FDHL? What is the Concept of Capital Smart City? How Much Area is Capital Smart City Planned Over? What are the Exclusive Features of Capital Smart City? What is Difference Between Overseas Block and Local Blocks? What is the Benefit of Buying in Overseas Block? I Live in Pakistan, Can i Book a Plot in Overseas Block? How Many Plots are There in Capital Smart City? What is the Exact Location of Capital Smart City? Why Do They Call it Islamabad if It Falls in Rawalpindi? What is the Road Access to Capital Smart City? Can We Approach the Society from Motorway M-2? Will It be Accessible Through Rawalpindi Ring Road? Is Capital Smart City Approved by RDA? What is NOC Number of Capital Smart City? Which Company has Designed the Master Plan of Capital Smart City? Is the Master Plan Map of Capital Smart City Available? Who is the Developer of Capital Smart City? Does HRL Own Any Other Housing Projects in Pakistan? What is the Launching Date of Capital Smart City? What is the Balloting Date of Capital Smart City? What is the Story of Merger of Capital Smart City with DHA? Why Do Some Agents Call it DHA Capital Smart City or DHA Smart City? Is it Safe to Buy Resale Files of Capital Smart City from Open Market? What Will be the Return on My Investment in Capital Smart City? Is My Investment at Capital Smart City 100% Secure? Why Capital Smart City Bookings are Open for so Long? What is the Payment Plan of Capital Smart City? Are Given Prices Inclusive of Development Charges? How Much Do We Need to Pay for Development Charges and When? When are They Going to Revise Plot Prices? What is the Booking Procedure of Capital Smart City? How Long does it Take to Complete the Booking Process? Is My Plot Confirmed if I Pay 10% Down Payment? Can i Book a Commercial Plot Now at Revised Prices? How Can I Book a Confirm Corner or Boulevard Plot? How Much Time Will it Take for Possessions? Is There any Discount Offered if I Pay Full Amount at Booking? Where Can i Submit the Application Form to Book My Plot? We have endeavored to include all relevant questions about Capital Smart City in the above list, however, if you didn’t find answers to your questions, you can contact us for further assistance. Future Developments Holdings Private Limited is a consortium of internationally renowned companies, i.e. Engineering Dimensions Private Limited (EDL) and China Liaoning International Cooperation Group (CLIC) in association with FWO. The international giants have come together to revolutionize the housing and industrial sectors of Pakistan by establishing state-of-the-art projects along the Motorway M-2 and CPEC. HRL has partnered in the project through their subsidiary “EDL”. HRL’s CEO Mr. Zahid Rafique chairs the executive committee of FDH. HRL’s GM Mr. Aslam Malik is Chief Operating Officer at Capital Smart City, and he is directly in charge of the planning, development and investments in the project. You can find him in almost all the events and meetings of the society. Capital Smart City is an initiative of FDHL to introduce the smart city concept for the first time in Pakistan. A smart city is any city which uses information and technology to manage its resources efficiently. It uses different types of sensors, and data collection methods to make public services more efficient and produce a secure environment. For example, Dubai is using smart city technology for parking, transportation, traffic routing and infrastructure planning. Singapore is considered to be a gold standard smart city, as it uses sensors and IoT enabled cameras to monitor the city, the environment and the transport services. It also uses technologies to monitor real time usage of energy, waste production, and water use. Capital Smart City has been designed by “Surbana Jurong”, a Singaporean Government-owned urban planning firm. The society will use latest technologies and sensors to monitor the environment, security, public safety, public health, waste production, transportation and energy consumption. Capital Smart City is currently planned over an area of about 45 thousand kanals of land, however more land is being purchased for future extensions. Current development work is being carried out over an area of 25000 kanals in the first phase of developments. 1- A clean and tranquil environment away from the chaos of Rawalpindi and Islamabad. 2- Use of smart city technologies to ensure public safety, health, security, entertainment, transportation, environmental hazards and air pollution. 3- Provision of luxury lifestyle, including exclusive entertainments arenas, theme parks, golf course, international standard eduction and health institutions and BRT System. 4- Exclusive shopping arcades, and commercial hotspots to attract businesses. 5- Residential blocks include Crystal Lake, Hills Vista, China Village and Overseas Block. 6- Commercial blocks include Financial Square, Aviation Village and FDH Buildings. 7- More amenities include Masjids, Parks, Jogging Tracks, Holiday Park, Healthcare City, Education City, BRT System, Criminal Defence System, Water Treatment Plant, Free WiFi zones and much more. There is not exact number available as to how many plots are currently being sold by the Company. An estimated figure is around 10,000 plots, however it can be a bit less or more. As per the company’s policy, the society will sell no more than 80% of the planned plots. Remaining plots will be used in future launches at revised prices. Capital Smart City is located in Mouza Chahan and Mouza Mandwal. Current development is taking place in Mouza Chahan near Chahan Dam site, hence you see a big water reservoir on Google Maps right next to the society. Current road access is through Chakri Road. You can either use chakri interchange if you are coming from motorway m-2, or you can use internal roads of Rawalpindi to access Chakri Road. Future access will be much easier through Rawalpindi Ring Road, and a dedicated interchange on Motorway M-2. What is the Difference Between Overseas Block and Local Blocks? There is little difference between Overseas Block and Local blocks. There is no location difference; both lie opposite to each other, however a few more security features will be enjoyed by the residents of overseas block, i.e. facial recognition cameras, electric bikes and smart security cards. The major benefit of Overseas block besides additional security features is, of course, early possessions. It is the first block to be developed in Capital Smart City. If you are buying to build your house by next 3 years, Overseas block is the right choice. Well, you cannot book a plot in Overseas Block unless you have residence outside Pakistan. If you can use overseas address and numbers for communication, you can apply for overseas block. Alternatively, you can buy an overseas residential or commercial plot from secondary resale market and get it transferred to your name. Actually it lies around Motorway M-2, which is known as Islamabad Motorway, hence it is called Islamabad, and not Rawalpindi. After the revision of the master plan of Islamabad, this whole area alongside the motorway m-2 up to Islamabad Airport is expected to fall under CDA. If you happen to visit the Society from Chakri Road, you will find a notice board close to the entrance of Capital Smart City, which reads “Proposed Site for Ring Road”. As the Government has already approved the project and released payment for purchase of land, it will take about 2 years to get easy access to the society through Rawalpindi Ring Road. Well, currently the access is through Chakri Road only. However, a dedicated interchange is planned on Motorway M-2 for direct and easy access. The society has purchased thousands of acres of land which is stretched along the motorway for about 6 KM. FWO will work on the dedicated interchange after the final design is approved by NHA. Yes, the initially submitted plan of Capital Smart City was duly approved by RDA. However, the revised plan including the extension area is currently under approval process at Rawalpindi Development Authority. As per the approved societies list, Capital Smart City is listed on 45th number in approved housing schemes falling under RDA. A Singaporean based Government-owned firm “Surbana Jurong” is responsible for the urban planning and designing of the master plan of Capital Smart City. Surbana Jurong is internationally renowned for designing smart cities across the globe in various countries. Yes, a broader provisional master plan of Capital Smart City is available and approved but it is not disclosed publicly. Final map will be disclosed to general public after the ballot of plot numbers. HRL itself is one of the biggest private developers in Pakistan. So, all the earth work and basic infrastructure development work is being carried out by Habib Rafique Private Limited. Yes, it does. HRL has developed a couple of housing projects by the name of “Royal Orchard Housing” in Multan, Sargodha and Sahiwal. HRL has used another subsidiary company “Royal Builders and Developers” to launch those housing schemes. Well, there is no official date announced as yet. Once the revised and extension area plan is approved by RDA, we can expect official launch of the project. Earlier the project was expected to be launched in September 2018, however it was delayed due to plan revision and involvement of DHA. FDH has not announced any specific date for balloting yet. Once bookings are closed, and project is officially announced, a specific balloting date and venue will be announced for the computerized ballot for plot numbers. We are expecting the ballot by the 3rd or 4th quarter of 2019. As per the hearsay circulating in the market, DHA is buying 35 to 40% shares of Capital Smart City. Both parties are having negotiations on financial terms and JV framework, however broader terms have been agreed on by both the parties. Agreement with NDU is being considered as part of the partnership agreement between HRL and DHA. Secondary sources confirm the news, however official version will come from DHA only once they finalize their terms. As per the market news, the society name will be changed to DHA Capital Smart City or DHA Smart City after the official announcement of DHA partnership in the project. There is still no official footing of this news, therefore we do not use DHA’s name only to sell Capital Smart City. Yes, it is safe. All you need to do is find a good company to get you files from the market. Especially, if you want to buy files of overseas block, you have to make sure that you are buying what you are paying for. Some frauds have happened in the market, especially in case of commercials in secondary market. Few dealers sold cheap local files in the name of overseas block, and looted the naive customers. Therefore, if you want to buy from secondary market, double check what you are buying before you pay. Capital Smart City is a medium to long term investment opportunity. It is more preferred if you are looking to build your house in a peaceful environment while enjoying modern facilities. Short term gain is expected after the expected DHA Merger, and expected ballot for plot numbers when map will be officially released. If you hold for 3 to 5 years, you can earn as much as 100% to 200% returns due to some major developments. 1- Ring road and motorway access will be ready by then, so access will be direct and much shorter. 2- Overseas block and few other blocks will have possessions, and mass scale construction work will have begun by then. 3- Commercial markets will have been developed, and smart city features will have been implemented. 4- Hospital, University, Golf Course and other amenities will have been ready or near completion. As the Twin Cities are growing out of their boundaries, and master plans of big cities are being revised by the present Government, you can expect the area along the motorway and Islamabad Airport to be the most valuable for living by next 3 to 5 years. So if you go for medium to long term, things will have been quite materialized to evaluate the actual worth of plots at Capital Smart City. Yes, it is 100% secure. The team behind Capital Smart City has a 6 decades long history of achievements and it is an internationally renowned organization. Moreover, the society has acquired more than the planned land, and its broader master plan is approved by RDA. Capital Smart City is one of the biggest housing initiative which launched about a year ago, when property markets in Pakistan were going down. It took some time for people to understand the concept and background of the project, therefore not many plots could be sold in first few months. After the physical development started, and the actual plan unfolded, people started to respond positively and most of the plots were booked over the past few months. At present, bookings are almost closed for 5 marla and 7 marla plots, while other sizes have limited availability. Bookings will be officially closed very soon, so now is the right time to make a good decision. Are the Given Prices Inclusive of Development Charges? No, the given prices of residential and commercial plots are exclusive of any development charges. It is just the cost of land, which is payable in 3 years. Development charges will be applied near the final stage of development. Farm House prices are, however, inclusive of development charges. Development charges for residential plots will be around 1 lac per marla, so a 5 marla plot will cost 5 lac development charges. Similarly, development charges of commercial plots will be around 5 lac per marla, so a 4 marla commercial plot will cost 20 lacs development charges. Development charges will be applicable near the final stages of development, i.e. after about 2 to 3 years or so. Are They Going to Revise Plot Prices? Yes, plot prices are going to be increased very soon, as very limited bookings are left. Expected revised prices of residential plots are about 15 to 30% higher than current prices, while commercial plot prices may be revised by 50% or more. 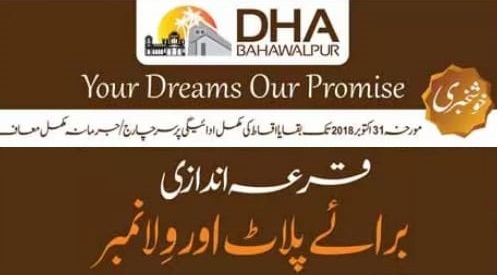 As per market news, DHA has shared its desired price list with HRL, wherein commercial plot prices have been revised by 400%. After the booking process is complete, and your intimation letter is issued from the head office, you can either collect it personally or we can dispatch it your given address. Booking process starts after you submit your application form, along with documents and down payment. You will be given a receipt against your documents at the time of booking. It will take around 4 weeks to get your file issued from the head office, and same shall be delivered to you by hand or via courier. Well, you will need to pay another 10% confirm charges after 30 days of 10% booking amount. If you do not pay the confirmation charges within given time, your booking may be canceled. If you pay according to the given payment plan, your allotment will be confirmed after the computerized ballot for plot numbers. No, you cannot. Commercial plots were launched in a very limited quantity and all plots were sold within a few weeks. It is expected that more commercials will be launched at much higher prices after the official launch of Capital Smart City in Pakistan. If you want to confirm a category, you will need to pay at least 40% amount as down payment. If you book with 10% down payment, you plot will be included in the ballot for categories. You may get a corner or boulevard plot or not, it is not guaranteed. If you 40% amount, you can get approval of desired category right at the time of booking. If you opt for confirm category booking, we will recommend that you pay 50% down payment. If you pay half amount, you are eligible for 5% discount. So, you will save good money and get your confirm category booking with 50% payment. How Long Will it Take for Possessions? Since HRL is one of the biggest developers in Pakistan, you can expect much quicker delivery. Officially, the society has set the target of possessions by mid 2021 for overseas block, however they are working vigorously to transcend their own targets. Yes, you have two discount options available at the time of booking. If you pay 50% amount at the time of booking, you get 5% discount from the total price, and if you pay 100% amount at the time of booking, you get 10% discount. Application forms can be submitted along with down payment and documents at Manahil Estate’s office in Bahria Town Phase 7 Office, or our side-office at Silver Square Plaza, F-11 Markaz, Islamabad.